Which cereal was promoted with the lines "I'm not gonna try it... Let's get Mikey. He hates everything"? 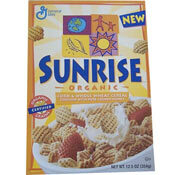 Sunrise Cereal is considered to be the first certified organic cereal from a major manufacturer. The cereal was a combination of organic wheat, corn, oats and brown rice flavored with honey. Despite a $15- to $20- million marketing campaign - General Mills' biggest advertising push for a cereal up to that time - Sunrise Cereal didn't last. The campaign included the distribution of 17 million samples - General Mills' largest sampling up to that time. According to General Mills, the cereal was produced in response to consumer requests for more organic products. "We're very excited about this launch," says Scott Lutz, Vice-President of New Enterprises for General Mills in 1999, "It is an excellent example in the value of really listening to the consumer. Food plays a central role in consumers' lives and the rapid growth of organic foods is a clear signal of this." 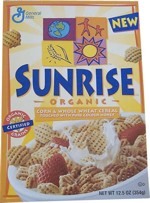 Sunrise Cereal was tested with consumers in the Summer of 1997. After tweeking the cereal and it's presentation, and after more testing, the cereal was formerly introduced at the Natural Products Expo West in Anaheim, California on March 12, 1999. Can a breakfast cereal save the Earth? A General Mills health cereal has teamed up with AmeriCorps to target health-conscious, environmentally aware college students. Sunrise Cereal has allied itself with President Clinton to save the planet. General Mills' high-profile, cornmeal-based breakfast food plans to donate $1, up to a maximum of $100,000, to AmeriCorps' organic-farming and Na-tional Park Service programs for every person who enters a box-top code at the Website www.sunrisecereal.com. "Now millions of Americans will receive the call to service from the breakfast table," the president said June 27, referring to the photos of three AmeriCorps volunteers on Sunrise Cereal boxes. These volunteers are "getting things done," according to the blurb on the Sunrise box, by teaching organic gardening in Austin, Texas, restoring habitats at Yellowstone National Park and rehabilitating the Appalachian Trail. Both AmeriCorps and General Mills are targeting the Sunrise Cereal "psychographic": a set of consumers grouped by ideology, instead of age, race, gender or class. The Sunrise psychographic -- the people who drive the booming U.S. organic-foods market -- are highly educated, affluent, altruistic and environmentally sensitive. It seemed a no-brainer to connect that market with AmeriCorps, a $477 million federal program with more than 40,000 volunteers. Clinton's domestic version of the Peace Corps is overseen and funded by the Corporation for National Service, or CNS. "Sunrise Organics shares a lot of the values AmeriCorps shares -- we want to do good things for the Earth," says General Mills spokesman Tom Johnson. "Organic food isn't just a product, it's a lifestyle. It's a product that demands that you be actively involved. We wanted to help people be actively concerned with their communities." The arrangement is a sweet deal for General Mills: Having spent $15 million to promote Sunrise in 1999, contributing a mere $100,000 for presidential sponsorship is nothing. For AmeriCorps, having Sunrise Cereal funnel young, granola-eating, health-conscious, environmentally responsible college students into their programs only increases their visibility and support. Click here to see all cereals from General Mills. What do you think of Sunrise? Nature's Path Organic Cereals are the greatest cereals of all time. They have been making them for 35 years. General Mills makes one weak effort to cash in on an industry built by Nature's Path and gives up. Instead buys an already successful cereal Canadian Farms so people would not know it was now General Mills. 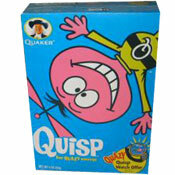 This was my favorite cereal of all time. I would pay ungodly amounts of money for a fresh box. Wish it was still around :( It was my favorite! General Mills needs to sell this in central Florida. Please and thanks!! !